Have you heard about the new IML Connector? It was announced in February 2010 and has been repeatedly delayed in coming to market. Well, it is almost here. 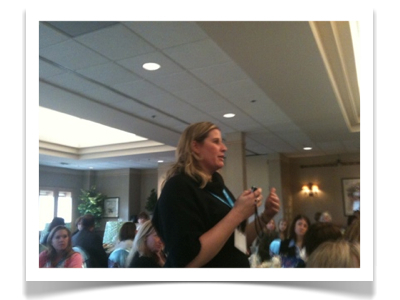 Last month, IML demonstrated the Connector at an MPI Minnesota chapter meeting. Luckily, I happen to be there. What is the IML Connector? The IML Connector is one of these one-size-fits-all super-whiz bangs for meetings and events. The centerpiece is a handheld device with a keyboard. It’s size and shape reminded me of the original Blackberry. I think that’s an impressive list of capabilities. When you consider that most of the other mobile guys are busy creating a more expensive way to show you an agenda on a 3 inch screen that people over 50 can’t read – I give these guys credit for going in a new direction. The microphone on this device is really something else. Attendees were holding it 6-18 inches away from their mouth (see picture above) and it worked perfectly to pick up their voice and project it through the house sound. (Note this demonstration was for 200 people over lunch). I thought this piece was really cool. Also, I liked how people could text in the comments. Attendees used the keyboard to type in questions. The questions/comments were shown to the panel on a confidence monitor. Then, the panel could answer the questions as they saw fit. This seemed to work really well. After a few questions were answered – more people caught on and started sending in questions. I am really interested in seeing how the multiple audio channels executes. I have some projects where it would be cool to project presentations from multiple rooms in a single lounge. Then, we would want to give the attendees in the lounges these devices to “listen in” on what is happening in the other rooms. I think this would be an awesome application of the technology. We will have to wait and see on this one. The microphone can give some wicked feedback if used incorrectly. Speakers and the A/V techs in the room will need to be trained on how to “coach attendees” to use these microphones. In our MPI session, it wasn’t until the 3rd person spoke that someone pointed out that they were holding the microphone to close to their mouth. Is this product really available? So far there are less than 100 of these devices in the US market. They are all being used for demos. 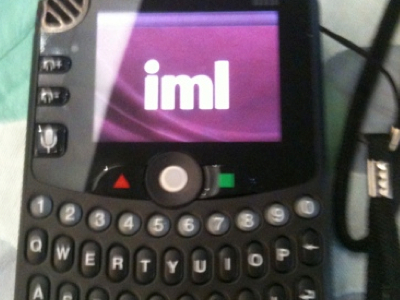 IML is doing it’s first “paid” in May 2011. So, this is probably something to take a look at for late 2011 or 2012. While most of the mobile providers are zigging these guys are zagging. I liked how these guys are trying to combine the three most common interactive capabilities (ARS, Q&A, Text Q&A) into a single solution. Have you seen this device in action? Do we want another device at our events? Or should we be striving to include all of these capabilities in our mobile phones?